Did Kim Jong Un Feed His Uncle To 120 Dogs? Be Skeptical : The Two-Way A gruesome story that first surfaced weeks ago is now whipping around the world. But there are many reasons to be doubtful about the claim that Kim Jong Un had his uncle executed by throwing him to a pack of starving dogs. "Kim Jong Un's executed uncle was eaten alive by 120 hungry dogs: report." 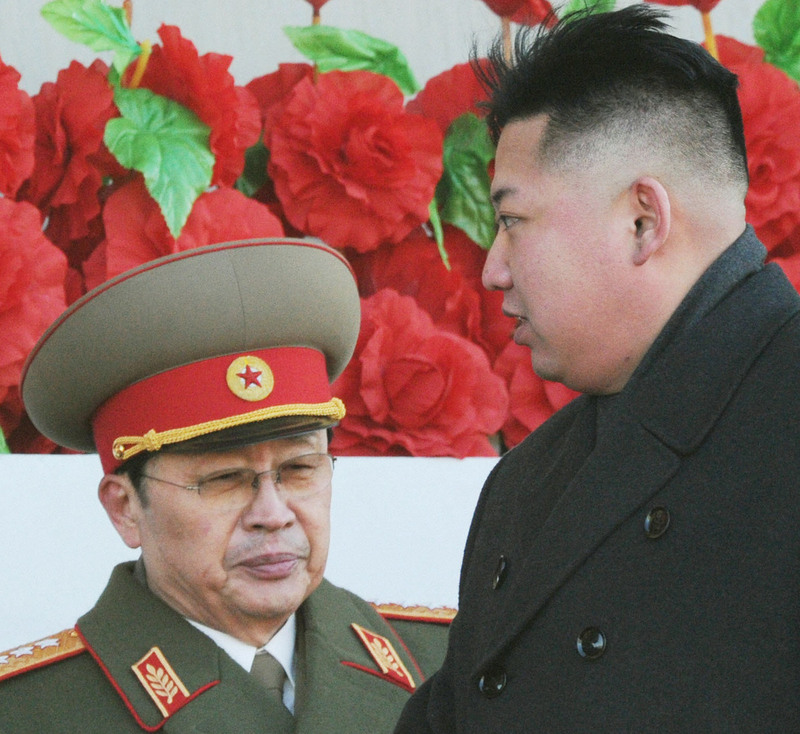 Before their split: North Korean leader Kim Jong Un, right, and his uncle, Jang Song Thaek, in February 2012. Earlier this month, Jang was executed. -- On Dec. 12, the same day the world heard that Jang had just been tried and executed for alleged crimes against the state, the relatively small Hong Kong newspaper Wen Wei Po claimed Jang had been "stripped naked and thrown into a cage" to be killed and eaten by 120 dogs. -- Twelve days later, The Straits Times of Singapore pointed to the story, adding that Wen Wei Po also claimed the execution by dogs had been supervised by Kim himself and witnessed by 300 senior North Korean officials. -- Then this week, the "month-long rumors ... inexplicably re-emerged," as Japan's NK News says. Why now? It adds that "Christopher Green, international editor at The Daily NK warned that mainstream media organizations had a tendency to reprint sensationalist stories on North Korea with little regard for truth." Ah, the truth. That brings us to the debunking. "The source. The story originated in a Hong Kong newspaper called Wen Wei Po, which oddly makes the claim without citing a source. With a couple of high-quality exceptions, Hong Kong media have a reputation for sensationalist and tabloidy stories that do not always turn out to be true. But, even by Hong Kong standards, Wen Wei Po is considered an unusually unreliable outlet." Wen Wei Po is still the only news outlet with the eaten-by-dogs account of the execution. -- Too Fast? What a scoop Wen Wei Po supposedly had: Key details of how the execution was carried out appeared just a day after it supposedly happened. But one has to ask: How did a newspaper 1,500 miles away get the story so quickly, and confirm it, from inside one of the world's most secretive states? -- Too Specific? Journalism's biggest fabricators in recent years have had a common approach — they dazzled readers with supposedly telling details to sell their stories. But one has to ask: Why were there precisely 120 dogs? Why had they supposedly been starved for three days in preparation? Why were there exactly 300 witnesses? Why did the execution supposedly last for one hour? -- Too Wild? North Korea has claimed it's the second-happiest country in the world. It has said the sky turned red when former leader Kim Jong Il died. Its archaeologists supposedly uncovered "the lair of a unicorn." If a story's too wild for even the North Korean propaganda machine to touch, you have to wonder about it. The Daily NK's Green suggests approaching a story such as this by asking a question: "It might be true, but is there any evidence or common sense to suggest that it is?"